Living in Singapore, you get ready access to a huge variety of cuisines. However, one cuisine that we don’t get much exposure to is South American cuisine. 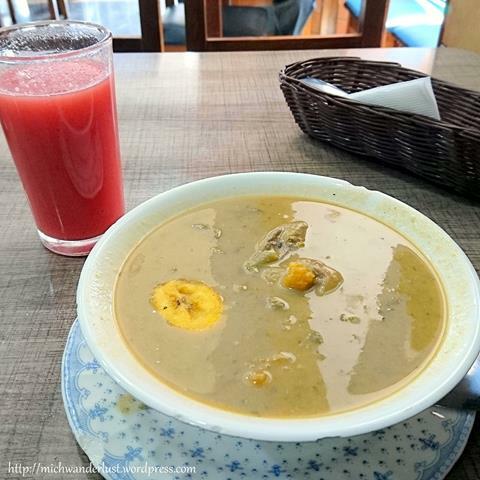 While there are some similarities with Indian food, Ecuadorean food is definitely very new to me and deserves its own post! This is typically a continental breakfast (e.g. coffee/tea, juice, eggs, bread with cheese). You can find restaurants selling these in Quito for under $2. There’s always juice, tea (in this case anise tea), fruits and bread with some meat and cheese or egg. A very healthy and balanced meal! There’s usually banana, papaya and sometimes pineapple (that’s a papaya ring above). The first day they provided some ground coffee as well but then realised that I didn’t take it. 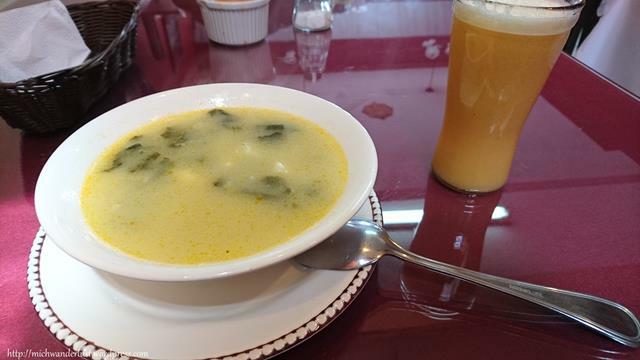 Again, the almuerzos here follow a basic pattern: juice, soup and main (rice-based) dish. You can eat something else – a sandwich, or a pizza, perhaps – but it’s not considered an almuerzo. E.g. 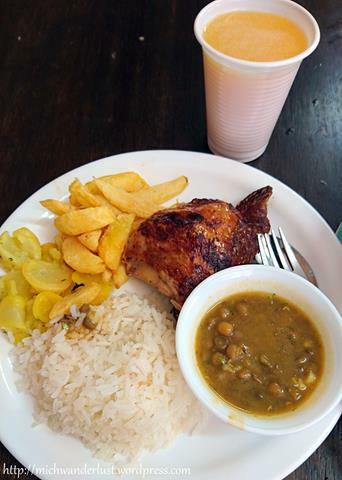 : orange juice, soup with chicken feet, rice and bits of carrot, and rice with fries, beans and roast chicken ($2.50). The beans remind me of dhal. I was astonished to find that eating chicken feet is not just a Chinese thing! 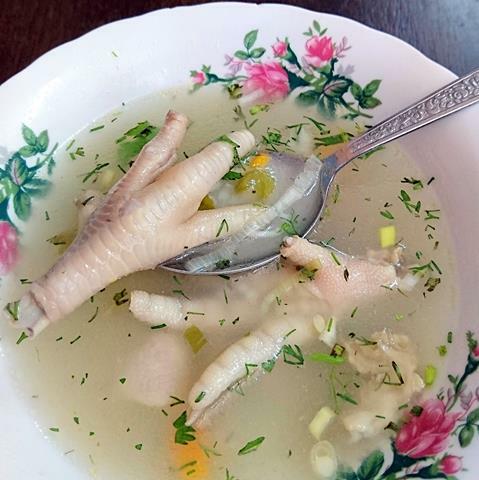 In Ecuador they often put chicken parts that you don’t normally eat in the soup – e.g. the neck, feet and even the head. Eating chicken feet was a nice feeling of familiarity and home. Juice, soup with fish and arroz relleno (fried rice with sausage, peas, carrots and a bit of banana). 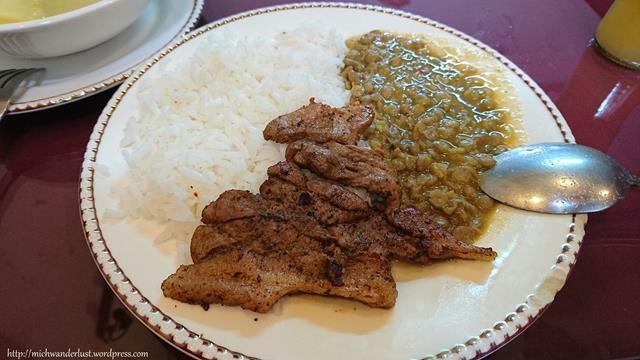 Juice, potato soup with veggies, and rice with pork chop and beans. 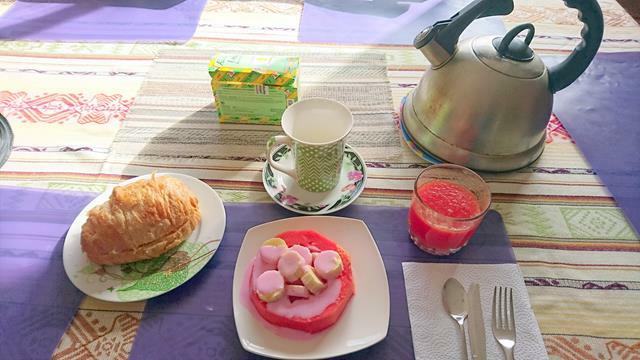 An example of the language differences between Spain and Ecuador – I learnt that dinner was la cena and una merienda is a snack, but here dinner is la merienda. La cena seems to mean something like a post-dinner snack or a special feast. My host family in Intag (where I spent 6 months) typically had a hearty soup for dinner, followed by a hot drink and possibly some bread. 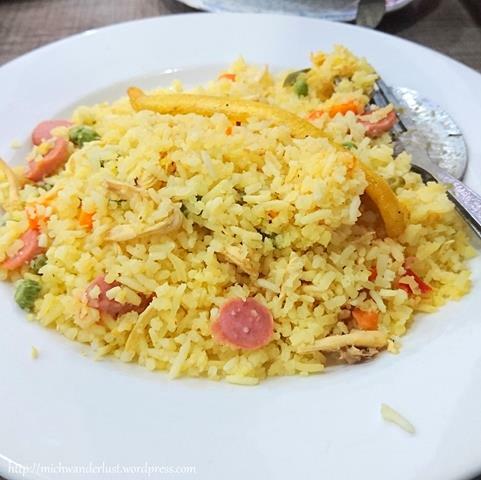 At times, we had the same thing as lunch – a rice-based dish. In Spain, a bocadillo is a baguette-type sandwich. Here, a sandwich is sánduche and bocadillos or bocaditos are snacks. Also, here una tapa means a lid, not food! Confused yet? At Yanapuma Spanish School, they have a weekly tasting of bocaditos. Each student is assigned one bocadito to bring and share, and we’re also expected to introduce it to the others – what it’s made of, how it’s made, etc. I got la humita – a very popular Latin American snack made from ground young corn (choclo), onions, eggs, butter, baking powder, salt/sugar and cheese (the ingredients may vary regionally). 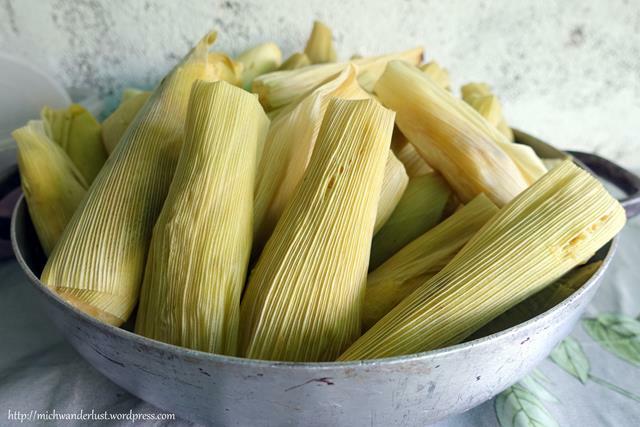 Mature corn (where the kernels are tough) is called maíz and it doesn’t work for this dish. 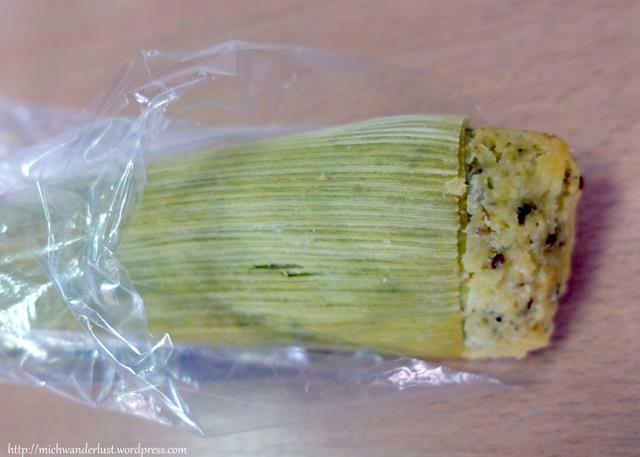 It’s prepared by wrapping the dough in a corn (specifically choclo) leaf and steaming for 30 minutes. 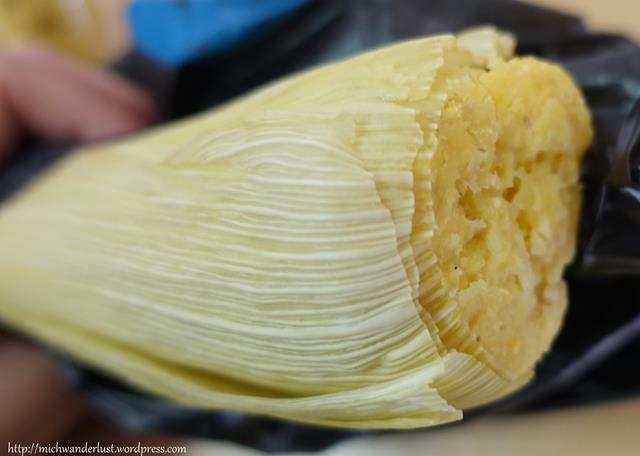 It’s so popular that there is a special pot for steaming the humitas – it’s called a tamalera. It can be either sweet or savoury, although the savoury version is more common. The one on the left above is sweet – you can tell by the black dots of anise. It’s not too sweet though. The one on the right is savoury. I also learnt to make them during my time in Intag and they’re surprisingly easy to make! The hard part is grinding the choclo, but you can also just blitz them in a food processor or even a blender (which I did when I tried to recreate them back home in Singapore. You end up with more chunky bits of corn, but it still tastes legit). Left: habas (broad beans). Right: caca de perro (corn – maíz – coated in salt and panela sugar). 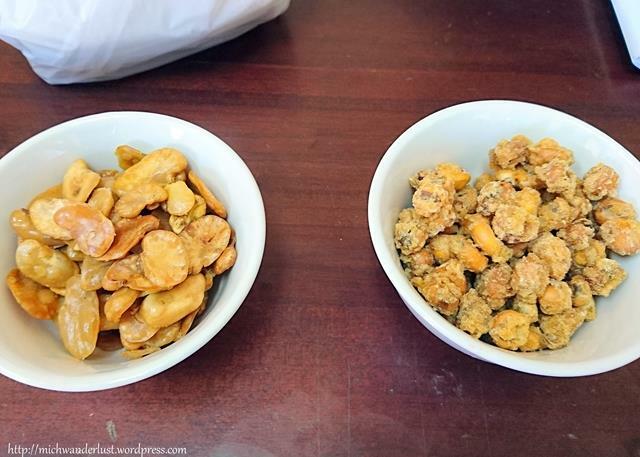 Left: chulpi (very similar to tostado but a smaller type of corn). 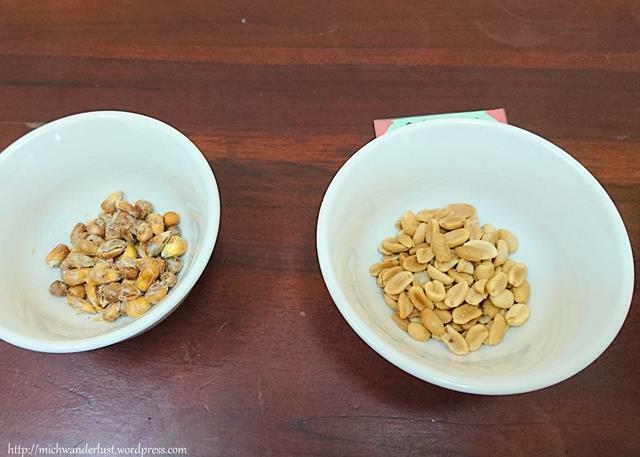 Right: salted peanuts. 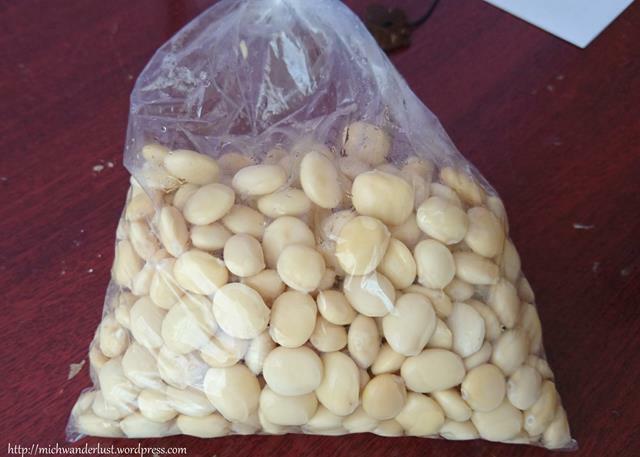 Later on, I bought chochos (which look like some kind of bean but apparently are legumes). They’re full of vitamins and protein and can be served with ceviche. This bag (I bought it full but ate quite a bit before taking the photo) cost $1. It has a very subtle taste that’s slightly bitter. Ecuadoreans usually eat it with other things like tostado! A quesadilla here is nothing like the Mexican version. It’s a pentagonal bun made of cornflour, butter, eggs, cheese and sugar. It’s a little too cheesy for my taste (I’m not a big fan of cheese). Of course, I can’t neglect to mention the very popular empanadas! This is a variety called empanada de viento (“wind” – because the dough is left to rest for a bit and rise). The taste is astoundingly similar to hum chin peng, one of my favourite Singaporean snacks. However, this empanada isn’t eaten plain like hum chin peng is. You can choose fillings such as cheese, chicken or beef. The drink above is called morocho, a type of corn that’s very tough. The morocho is chopped up into small bits and they add milk, cinnamon and other spices. Sometimes they add raisins too. 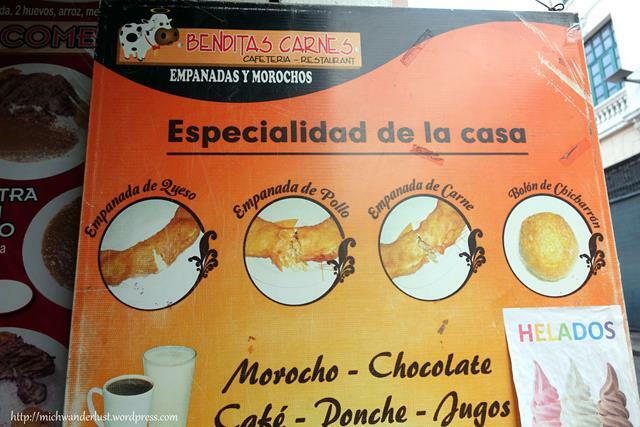 We ate at this restaurant that specialises in empanadas and morochos. You can choose a variety of drinks to go along with it, not just morocho. It’s located near La Iglesia de El Carmen Alto, a couple of minutes’ walk from La Ronda. 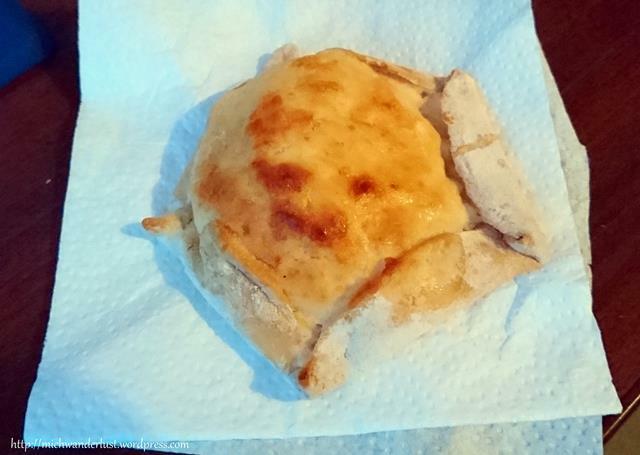 I also tried bizcochos – a type of biscuit made with flour, butter, eggs and anise. Apart from empanadas, my personal favourites are quimbolitos and humitas. 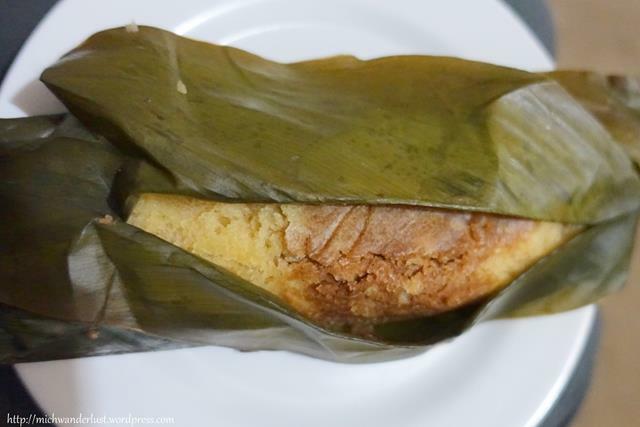 Quimbolitos are kind of like sponge cakes in texture. They aren’t made of terribly exotic ingredients: flour, egg, sugar, salt, butter, etc. – but their distinctive feature is that they’re wrapped in achira leaves and steamed. 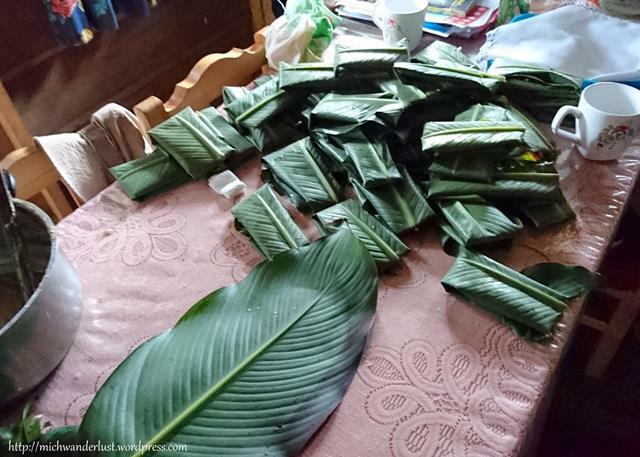 You can also wrap them in banana leaves (I tried this at home in Singapore.) You can put anything you want in them to jazz them up! 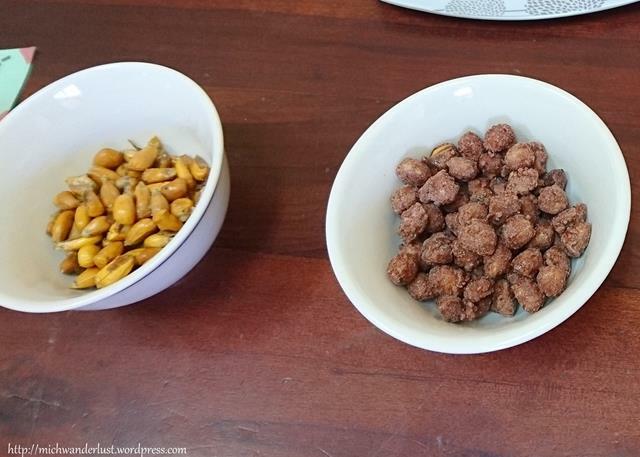 They’re good with raisins, cocoa powder, pumpkin bits – be creative! 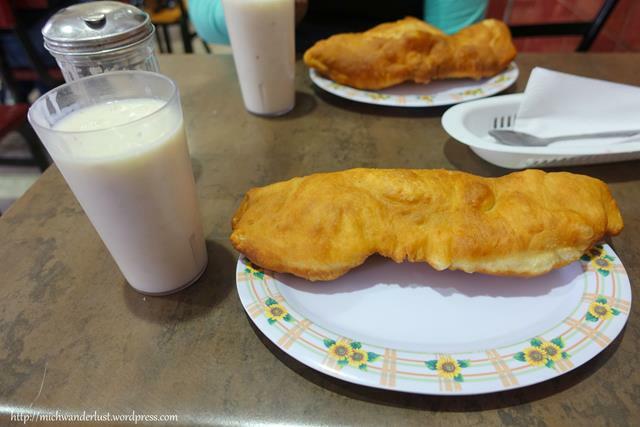 For a far more authoritative list of Ecuadorean street food/snacks, check out http://laylita.com/travel/270/15-ecuadorian-street-foods-must-try/. What’s your favourite type of street food? This post is part of The Weekly Postcard hosted by Travel Notes & Beyond, A Hole in My Shoe, Toddlers on Tour, Two Traveling Texans and Arnie and Jo are on the Go – check out what’s going on elsewhere! I love South American cuisine, especially the empanadas, although they are so fattening. They have a lot of fried foods (which I love), but they are very high in calories. Bizcochos sound great, although I never tried them. I loved the food when I was in Ecuador! I know one of their specialties is guinea pigs! I didn’t get up the courage to try it though. Thanks for linking up with #TheWeeklyPostcard! Thanks for your comment, Anisa 🙂 Yes, they do eat guinea pigs! I haven’t had the opportunity to eat it though – and honestly I probably wouldn’t if I had a choice. 😀 as an ecuadorean I can tell you you are not missing on anything haha they taste funny and you kinda feel bad eating them because they are such cuties! I used to live near a great place for empanadas – yum! I haven’t been to Ecuador but Laurence spent a couple months there and talks about how cheap and filling the food was during his time there. Look forward to going there. I’m not very familiar with Ecuadorean food. The empanadas look really yummy, and las humitas remind me of Mexican tamales. Yeah I think they’re really similar! Yummm, this makes me miss Ecuadorean food so much! Have you tried ceviche yet? Michelle, thank you so much for your food tutorial. 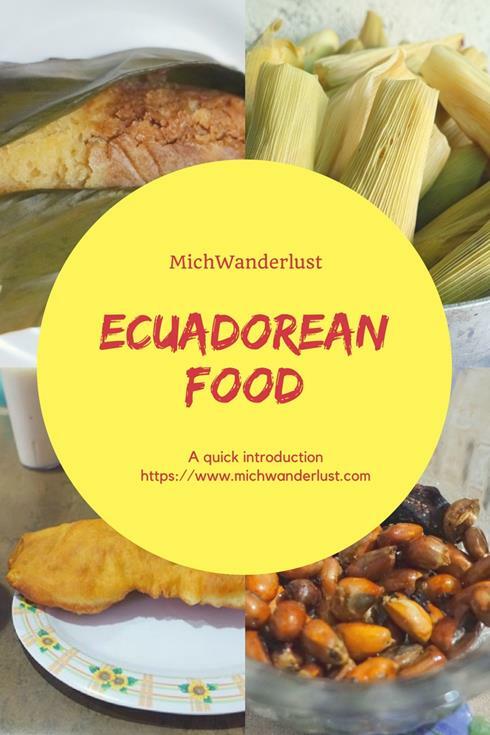 My hubby and I are headed off for Ecuador in a few days and I am so excited to give the local dishes a try. The empanadas sound yummy. Thanks, Joanne! Are you still in Ecuador? Hope you’re enjoying (or enjoyed) it as much as I am! Michelle we have 11 days remaining. Total time here almost three weeks. Great post Michelle!!! I can’t wait to try Ecuadorean food on my upcoming trip!! Thanks for sharing! Thanks and hope you have a wonderful time in Ecuador! Fellow Singaporean here! Finally heading to Ecuador tonight. The food is so different from Peru and Bolivia! Must try all haha, but it also means I can’t save money by cooking anymore 🙁 Thanks for sharing! Hey Owen! I’ve been following your Peru adventures on your IG and it looks like you’ve been having such fun! It’s really interesting that the food in Peru and Bolivia is so different. The food in Colombia was pretty similar to Ecuadorean food (although I didn’t visit the coast in either country, so I didn’t eat any ceviche and the like haha). Don’t worry, food in Ecuador is generally pretty cheap! Especially the traditional food 🙂 Hope you enjoy Ecuador! !